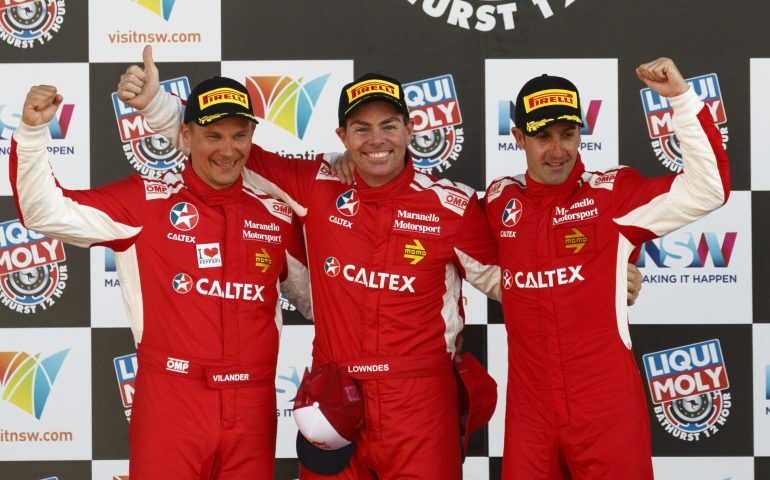 TONI VILANDER says his amazing late-race stint that saw him blitz the field in yesterday’s Liqui-Moly Bathurst 12 Hour was one of the better moments of his entire career. The 36-year-old Finn’s last stint in the race saw him build a massive lead over the No. 22 STM Mercedes-AMG GT3 – before handing his Maranello Ferrari to Jamie Whincup for the run to the flag – often lapping more than a second quicker than anyone else on the circuit at the time. The stint was critical to building the track position that would ultimately lead to the bright red Ferrari being in a position to allow Whincup to challenge Jamie Whincup for the lead within the final hour. “Sometimes you have those days, you have a clear track and just feel really comfortable in the car,” the two-time LeMans 24 Hour class winner explained. “Even all the traffic seemed like it was dropping in the right places with the right timing. I had clear air with the car and it felt like it was working perfectly. Sometimes when you’re fast it feels like it’s easier so today was definitely one of those days. For his part, six-time Virgin Australia Supercars Champion Whincup said the choice to run new tyres at the end of the race was a clear factor in making sure he could use the Ferrari’s clear pace advantage in the final hour of the race. “(The final pit stop) was strategic. We had to make a call as to whether we wanted to put tyres on and loose track position or whether we wanted to keep track position on older tyres. So, I made a call at the end there to put some new bags on and it was the right call,” he explained. “The car had great pace. It was very good down the straight, it wasn’t the quickest down the straight (gesturing to the #12 drivers) these boys beside me were absolute rockets and the Nissan wound it up again at the last five laps. Lowndes’ second 12-hour victory adds to his remarkable success story on the Mountain, adding to his six Supercheap Auto Bathurst 1000 wins and seven additional podiums in the October classic. Where he anchored Maranello’s 2014 victory by bringing the car to the finish, Lowndes’ played a different role this year by driving for much of the morning – making sure the car remained on the lead lap and in contention for when his teammates climbed in to the car later in the day. “We rolled the car out and didn’t do much with it over the course of the couple of days. It was a much nicer car than the Ferrari 458 over the top of the mountain for both Jamie and I as far as becoming familiar with the car. We did have a good lead into this weekend and we did have some issues but we rectified that. With Toni putting it on pole yesterday we knew that we had a strong car, we just didn’t know who else was going to be strong for the day,” Lowndes said. The controversial restart incident that saw the No. 88 car briefly punted into the sand at Meguiar’s turn by the STM Mercedes AMG was Lowndes’ biggest challenge throughout the day. Quick action from the officials at Murray’s ensured the car remained on the lead lap – critical to ensuring their chance of victory. “The main objective for me was to stay out of trouble and keep it on the lead lap which I was lucky to do – getting out of the gravel trap,” he said. Maranello’s victory was the second for Ferrari in the Liqui-Moly Bathurst 12 Hour, coming three years after their first. The Prancing Horse joins Audi as the only brand to win more than one 12-hour, while Melbourne-based Maranello Motorsport is the only team to have won multiple 12-hours in the GT era. Though Audi won back-to-back races in 2011-12, the 2011 victory was engineered by Team Joest while the subsequent victory by Phoenix Racing.